Prince George, B.C. – Smoke from the fires south of Prince George is being tracked by Environment and Climate Change Canada (ECC). If you click here, or on the image above, the Blue Sky app, will show you where the smoke is expected to go. 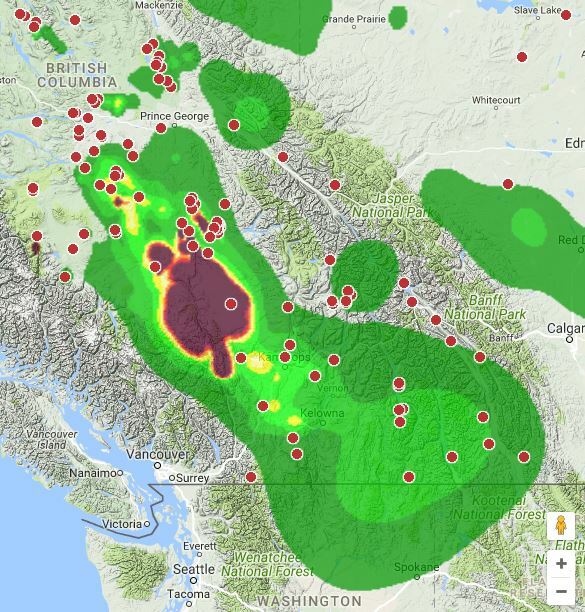 “Smoke has become an issue across much of the Interior of B.C. and much of the lower mainland as well” says Dr. Bonnie Henry, Deputy Provincial Health Officer for B.C. Dr. Henry says the situation is “very challenging” as those who are in the thickest smoke, are also those who are closest to the fires. “We do have a response for forest fire smoke that we have been working on in a coordinated way with the Ministry of the Environment and others” She says they have been meeting regularly over the past few days to get a better understanding of what’s going on. I know that these are special circumstances, but does Dr. Bonnie Henry, Deputy Provincial Health Officer for B.C. have anything to say in support of air (smoke and fine particulates) pollution from annual slash burning and use of wood stoves?